Popcorn and I have a special relationship. We’ve spent a lot of time together over the years. For as long as I can remember, it’s been one of my favorite things to eat. I keep it simple. The perfect recipe is a huge bowl of salted popcorn, a couch, and something ridiculous to watch on tv. I used to make chile oil for the sole purpose of using it to pop popcorn, but these days, I use plain grapeseed oil, pop the kernels in a Whirley Pop, and sometimes add truffle salt. However, every once in a while I’m willing to try new things with this beloved ingredient. An occasional caramel corn is not out of the question. 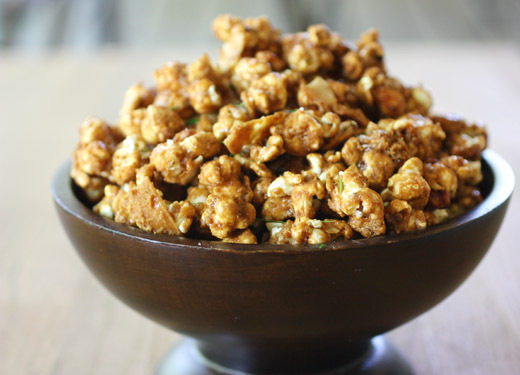 In fact, when I saw this Coconut Curry Caramel Corn in Susan Feniger's Street Food , I wasted no time in gathering everything I needed to make it. The recipe is also available online. 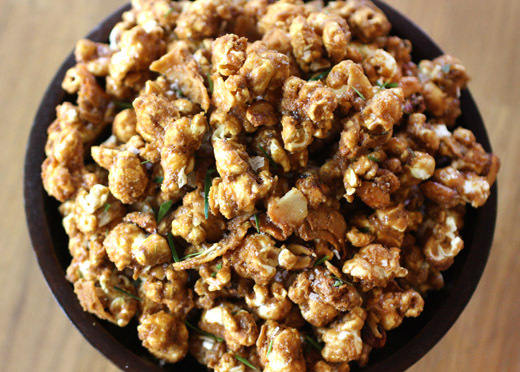 Some sweet and spicy candied peanuts are made with finely chopped lime leaf and coconut milk, and those are mixed into the caramel corn. 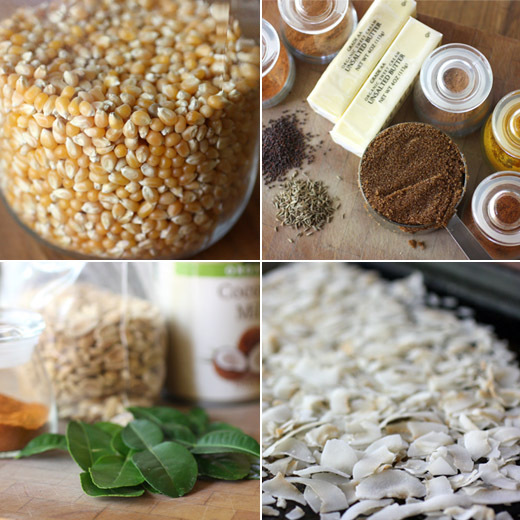 Then, spices like cumin seeds, mustard seeds, turmeric, and cayenne are mixed into the caramel before it coats the popcorn, candied peanuts, and some toasted coconut. Luckily, the recipe makes a lot because this was a very addictive snack. Making the candied peanuts was quick and easy, and they can be made in advance and stored at room temperature. You don’t want to walk away from the stove though. They need to be stirred and the heat may need to be turned down to prevent burning. Unsalted peanuts were mixed with coconut milk, dark brown sugar, finely chopped lime leaf, salt, and ground cayenne. The mixture was transferred to a saute pan and cooked over high heat for almost two minutes before stirring while continuing to cook for another five minutes or so. The nuts were then spread on a baking sheet and left to cool and crisp. Next, big pieces of shredded coconut were toasted in the oven while popcorn was popped. The popcorn, coconut, and candied peanuts were combined in a large mixing bowl. To make the caramel, butter, brown sugar, and corn syrup were combined in a saucepan and cooked while stirring until it reached 255 degrees F. Off the heat, salt, baking soda, cumin seeds, mustard seeds, turmeric, mace, paprika, cayenne, and cinnamon were added. The curry caramel was poured over and mixed into the popcorn mixture. Last, the caramel corn was spread on two baking sheets and baked for an hour at 250 degrees F and was stirred every twenty minutes. As I wasn’t able to stop eating this caramel corn, I noticed that one bite would seem sweet while the next seemed a little hot from the cayenne. Then, I’d notice the other spices more in the following bite before the sweet flavor returned again. It made it very hard to step away from the bowl of caramel corn. I think it will work just as well as my usual, simply salted popcorn in the recipe above with the couch and tv. When I see a big, gorgeous, head of red cabbage like the one that was in our CSA box a couple of weeks ago, my first thought is slaw. I just checked, and I’ve posted about slaw almost as many times as I’ve posted about scones, but here’s one more that’s very worth considering for Memorial Day weekend or any summer party. 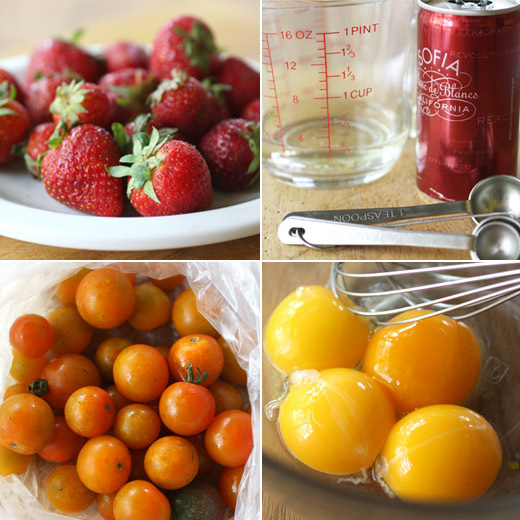 It’s from Plenty , and the recipe is also available online. Like most things from that book, this brings together flavors I might not have thought to combine but that obviously belong with one another. The original recipe name is Sweet Winter Slaw, but since I made it in the spring and for me it’s really about the mix of sweet and spicy, I renamed it. I also made a few changes to the ingredient list based on what I had available. First, rather than mixing Savoy cabbage and red cabbage, I used mostly red cabbage and added some thin julienned pieces of kohlrabi which also came in the CSA box. Next, instead of using mango and papaya strips for the sweet aspect of the dish, I cut thin strips of our first-of-the-season peaches. Other than that, I followed the instructions exactly for the lime juice, lemongrass, maple, and sesame dressing and the sweet-spicy caramelized macadamia nuts. 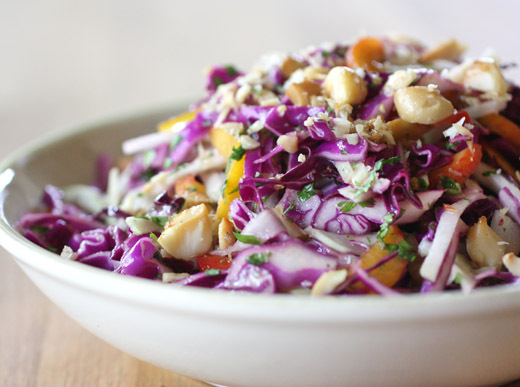 With cabbage, fruit, nuts, chiles, and herbs, this is a slaw that hits all of your taste buds. The first step is to make the dressing. Lime juice, a lemongrass stalk from my herb garden, some maple syrup, a little sesame oil, soy sauce, and red chile flakes were simmered in a saucepan until reduced and thickened a bit. That was set aside until cool and then strained into a bowl. Olive oil was whisked into the dressing mixture. Next, the macadamia nuts were toasted in a frying pan before butter was added and melted and then sugar, salt, and more red chile flakes were stirred into the mix. Once the nuts were coated, they were spread on parchment paper to cool before being roughly chopped. For the slaw, I used shredded red cabbage, julienned kohlrabi, strips of peaches, thin slices of chiles, and chopped mint and cilantro leaves. The dressing was drizzled over the slaw, some of the nuts were added, and it was tossed to combine. I saved a few nuts to sprinkle on top after placing the slaw in a serving bowl. 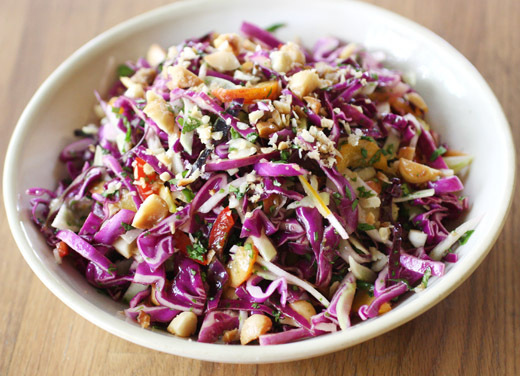 This is a slaw with a lot of crunch with all those raw vegetables and the nuts. And, the flavors play amazingly well together. 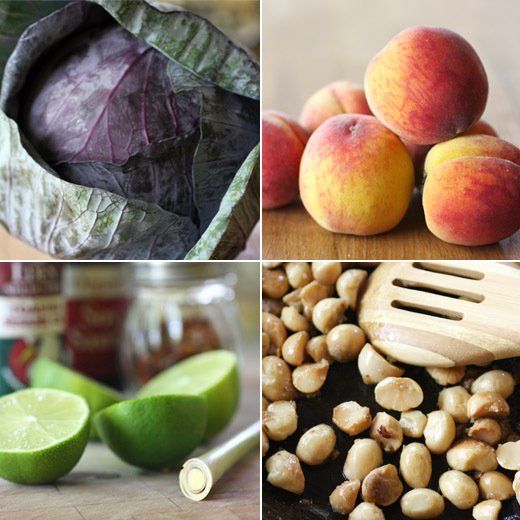 The fruit mitigates the bitterness of the cabbage, and the chiles keep the fruit from being too sweet while the sweetness calms some of the heat. It’s all just meant to be. I hope you try it. A couple of weeks ago, I mentioned the big bake sale that was being planned to raise funds for recovery efforts in West, Texas. I’m thrilled to report that it was a huge success, and we’re all so thankful to everyone who came out for the sale and made donations online. The total raised was over $19,000! As planned, I baked more of the Chocolate Chip and Cherry Scones, and I wanted to bring a second option to the sale as well. I was in a crumb cake kind of mood, and really, I’m always in the mood for a crumb topping. I found a great recipe in Baking: From My Home to Yours for a Cardamom Crumb Cake that has orange zest and espresso powder in the cake itself and in the crumb topping. I had to try it. Since I was baking for a bake sale, I made individual, small cakes in paper molds that are actually made for crumb cakes or so says the label. The little cakes were easy to slip into cellophane bags. I doubled the recipe in the book, lined up the paper cups on a baking sheet, and started filling them until the batter was gone. I ended up with ten little cakes. These paper molds are sturdier than a regular cupcake liner, but they didn’t hold their shape perfectly. What was perfect was the aroma of cardamom, espresso, and orange zest as the cakes baked. 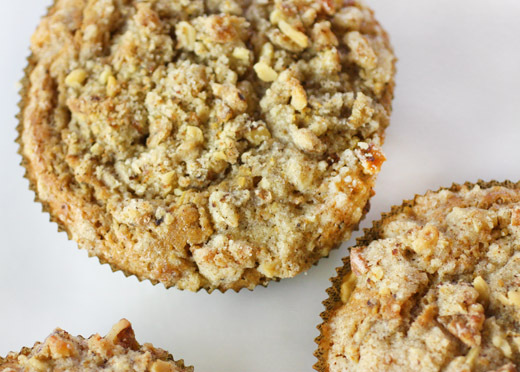 You start with the most important part—the crumbs. Flour, chopped toasted walnuts, sugar, orange zest, instant espresso powder and I always add a little extra, and cardamom were combined in a bowl. Butter was then worked into the flour mixture but not overworked. Big pieces of crumb topping are always a good thing. For the cake, flour, baking powder, and salt were combined with more cardamom and espresso powder. 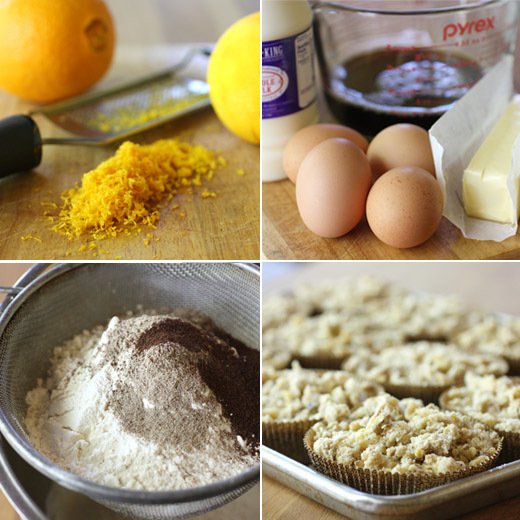 More orange zest was mixed with sugar, and Dorie suggests rubbing the sugar and orange zest together with your hands. 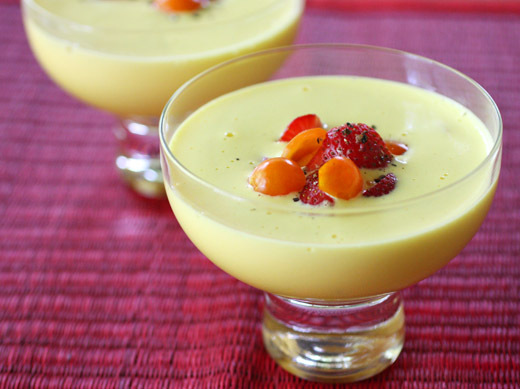 It releases the oil from the zest and ensures the zest will be well-distributed in the batter. The wet ingredients included melted and cooled butter, eggs, whole milk, brewed coffee, and vanilla extract, and they were whisked together and then stirred into the dry ingredients. 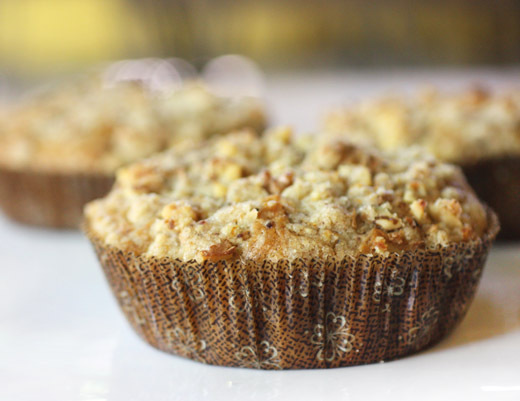 I scooped the batter into the crumb cake cups and topped each cup with crumb mixture. My little cakes baked for about 20 minutes. I only kept one cake at home to taste and soon wished I kept at least two. But, luckily, it’ll be quick and easy to mix up the batter and crumbs again. In the book, Dorie includes a tip about baking extra crumbs on a baking sheet and using them to top pots de creme or ice cream. That’s one more reason I’ll be making this again soon. For the past couple of weeks, I’ve been cooking from the new Malouf book, New Middle Eastern Food , of which I received a review copy. This is a beauty of a cookbook. You might say it’s a coffee table cookbook, but that doesn’t mean the recipes are very difficult or overly complicated. This latest book brings together the authors’ favorite dishes from all their earlier books with some updates and a few new things as well. Right away, you’ll notice the stunning photos and food styling. A simple Tabbouleh with Roasted Hazelnuts is presented in a pretty mound surrounded by the nuts, the Egyptian Eggs with Dukkah is shown with a coated, soft-boiled egg perched in a nest of very thinly sliced dried chile shreds, and on it goes with eye-catching photos throughout the book. The first dish I tried was the Crunchy Red Lentil Kofte with Fresh Mint made with bulgur and Turkish red pepper paste which caused me to fall hard for said pepper paste. I found it at Phoenicia, our neighborhood Middle Eastern market, and it’s not hot and spicy but it’s not sweet either. It just has a lovely pepper flavor, and I’ll be putting it in all kinds of things from now on. The kofte were served in little lettuce cups and topped with a lemon and olive oil dressing. I also made the Sis Kebabs with chicken instead of lamb, and the meat was marinated with lots of warm spices like cinnamon, allspice, paprika, nutmeg, and black pepper. 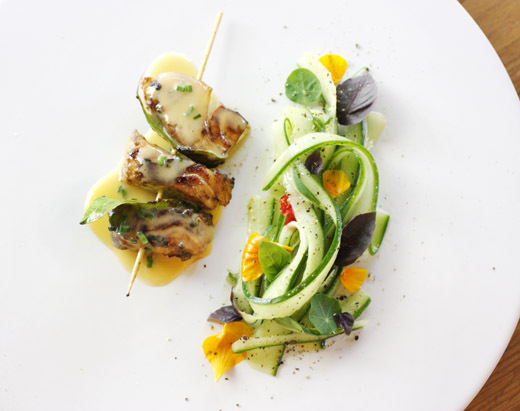 The spiced, skewered chicken was delicious with Basil Tzatziki. Then, I discovered the wonder that is Preserved Lemon Guacamole. I’m usually particular about my guacamole and prefer it very simple, but I wanted to give this a try. It’s made with smashed avocado as usual, and diced tomato, chopped cilantro leaves, finely chopped hot green chile, a little lime juice, some minced garlic, finely chopped onion, and the finely chopped rind of half of a preserved lemon. It quickly became my new favorite thing. 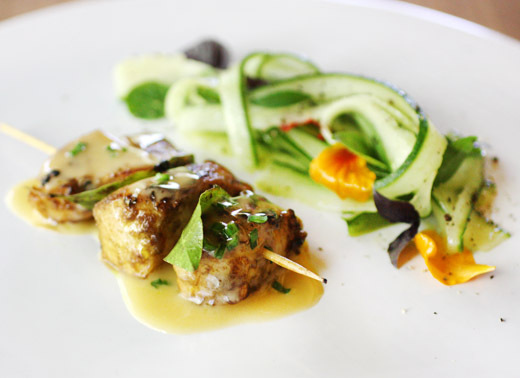 Since it didn’t seem right to make an entire meal out of the guacamole although I probably could have, I turned to the page with the Skewered Tamarind Fish with Dried-Lime Butter and Chives. Dried lime is an ingredient I’ve mentioned before, and I do enjoy any opportunity to use it. The limes are brown, a little shriveled, and completely dried. You can pierce them and drop them into a simmering soup or bash them into pieces and then grind the pieces in a spice grinder. The flavor is just as you’d expect: intensely of lime. Here, the dried lime was broken apart and simmered with water, lime juice, some sprigs of thyme, and I used white wine and a little vinegar rather than verjuice. The reduced liquid was strained so all the hard bits of dried lime were removed, and it was set aside. Meanwhile, chunks of fish, and I used black cod, were marinated in a mixture of tamarind paste dissolved in water, turmeric, and grated onion. After twenty minutes, the fish was skewered with bay leaves and quickly cooked for a couple of minutes per side. To make the sauce, some butter was added to the reduced and strained liquid. This was whisked to emulsify, and then slowly, more butter was added one cube at a time while whisking until incorporated. The sauce can be kept warm while the fish cooks and the salad is made. The salad was a tossed mix of long, thin slices of shaved cucumber, purple basil leaves, edible flower petals, and a lime juice and olive oil dressing. The rich butter sauce with bright lime was lovely with the flaky, white fish, and the fresh, crunchy salad was nice and light on the side. There are so many more things I want to try from this book like the flatbreads and crackers, and rice dishes and couscous, and the cute, little falafel made with favas and chickpeas. This book is definitely inspiring me to bring Middle Eastern flavors into my kitchen much more often. Recipe reprinted with publisher’s permission from New Middle Eastern Food . 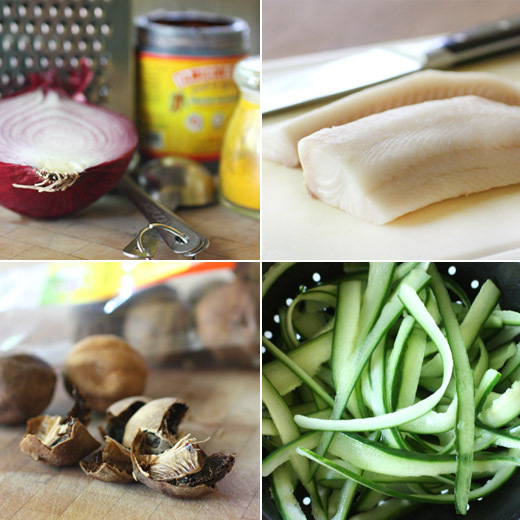 Remove any stray bones from the fish, cut it into 24 large chunks, and transfer to a shallow dish. Whisk the tamarind paste with the hot water until dissolved, then whisk in the turmeric and oil. Stir in the grated onion and pour the mixture over the fish. Cover and refrigerate for 20 minutes. While the fish is marinating, make the dried-lime butter. Put the cracked dried lime into a small saucepan with the water, verjuice, lime juice and thyme and simmer vigorously over a high heat until the liquid has reduced by half. Strain, discard the solids, then return the liquid to the pan. Add half the chilled butter, then reduce the heat to very low and whisk vigorously until the mixture comes together as a creamy emulsion. Slowly drop in the remaining butter, whisking all the time, until it has all been incorporated. Remove from the heat and keep in a warm place until ready to use. To make the salad, use a vegetable peeler to shave the cucumber fl esh into long strips, being careful not to include any seeds. Discard the seedy core. Tip the shavings into a colander set on a plate and refrigerate for 10 minutes. When ready to cook, preheat a barbecue or griller to high. Thread the fish chunks onto six metal skewers, interspersing two bay leaves on each. Grill for 4–5 minutes, turning a few times to prevent them from burning, and brush with the marinade as they cook. To finish the salad, combine the shaved cucumber, herbs and flowers in a large mixing bowl. Whisk the lime juice and oil together and pour over the salad. Season with salt and pepper and toss gently. Pile the skewers onto a warm platter. Stir the chives into the dried-lime butter and spoon over the fish. When I look at recipes for cakes, I make mental notes like “this one would be great for a birthday,” or “this is the cake for a spring party,” or “I have to remember this one during the holidays.” But, with the new book from Gesine Bullock-Prado, I was making all those usual mental notes and also thinking “I want to bake this cake just to see if I can do it.” The new book is Bake It Like You Mean It , and I received a review copy. There are showpiece cakes with intricate layers and beautiful frosting; there are meringues layered with fillings or built into a torte; and there are cheesecakes, mousse cakes, and even simple pound cakes. The Banana Caramel Slices are layered with chocolate sponge cake and caramel cream and topped with a chocolate glaze and caramelized bananas. The Citrus Angel Food Cake combines lime, orange, and lemon batter baked in one pretty cake. And, there’s a Checkerboard Cake, a Puzzle Cake, and a big roulade turned on its side that looks like it’s made with vertical layers when sliced. I want to make all of these cakes. There are clear instructions and tips, a good bit of humor to keep the book feeling fun, and helpful photos show the process for some recipes. After reading through recipes and looking at photos, I had several aha moments of realizing these cakes look more complicated than they might actually be to make. In addition to all those stunning layer cakes, there’s also a chapter for yeast-risen goodies like Brioche, Tangerine Dream Tea Ring, and Kouign-Amann. Since I didn’t have a handy occasion for a big cake with several layers and Kouign-Amann is something I’ve wanted to try making for the longest time, I started with that. This is a Breton cake, or mini cake depending on how it’s made, and the name quite appropriately comes from the words for cake and butter. There are only a few ingredients here which means it's a celebration of butter and sugar. So, this is a time to splurge on really good butter, and I used vanilla sugar from a jar where vanilla pods get stuffed after scraping out seeds. Making the dough for the little cakes is a lot like making puff pastry. A simple yeast-risen dough was rolled out, a block of butter was placed on one side, the dough was folded over, and it was rolled and folded, chilled, and rolled and folded again. For these cakes, the dough is rolled in sugar rather than flour. So, you end up with layers and layers of butter, dough, and sugar that are cut and folded into squares that bake into sweet, little, tender cakes with crispy, sugary edges. 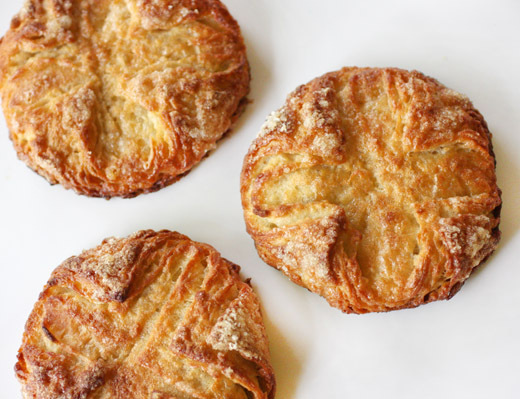 I love finding out things aren’t as difficult to make as they look, and the Kouign-Amann was a perfect example of that. This will be the book to grab when special occasions demand an impressive dessert. And, it’s also the book to grab when you just want to try baking something new and fun. Recipe reprinted with publisher's permission from Bake It Like You Mean It . 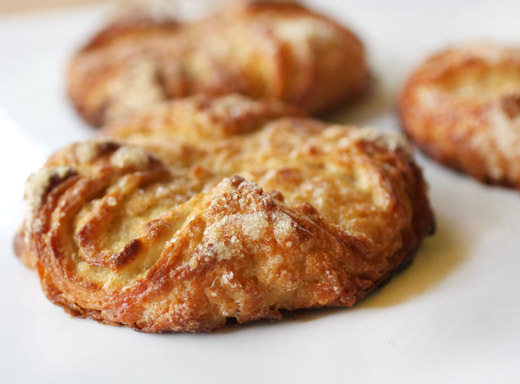 If you’ve had the pleasure of spending time in Brittany, no doubt you have had a taste of a kouign-amann. If you’ve had the pleasure of spending time in Brittany and you didn’t eat kouign-amann, then you never really went to Brittany at all because you can’t fully appreciate the place and her people until you take a bite of that crispy, sweet, buttery, slightly-chewy-in-the-center-and-caramelized-on-top-and-on-the-edges pastry. In the bowl of a stand mixer fitted with the hook attachment, combine 1 1/2 cups (360 ml) water, 1/4 cup (50 g) granulated sugar, and the salt. Add the flour and yeast and mix until a smooth, shiny dough forms, about 10 minutes. If the air conditions are very humid, you may need to add a bit more flour. If dry, add a few tablespoons of water. The dough should be smooth and pull away from the sides of the bowl. Spray a large bowl with nonstick cooking spray. Place the dough in the bowl and turn it over a few times to coat thoroughly. Cover with plastic wrap and place in a warm area of your kitchen to allow to proof until doubled in volume, about 1 hour. In the bowl of a stand mixer fitted with the paddle attachment, combine the butter and 1/2 cup (100 g) sugar. Mix until the two are well blended and the butter is smooth but not soft. Transfer the mixture to a piece of plastic wrap and shape into a rough 8-by-11-inch (20-by-28-cm) rectangle. Cover completely with plastic wrap and, using a rolling pin, gently even out the butter into an even block. Refrigerate for 20 minutes. Turn the dough out onto a lightly floured work surface. Lightly dust the top of the dough with flour as well. Roll the dough into a rough rectangle, approximately 12 by 18 inches (30.5 by 46 cm). 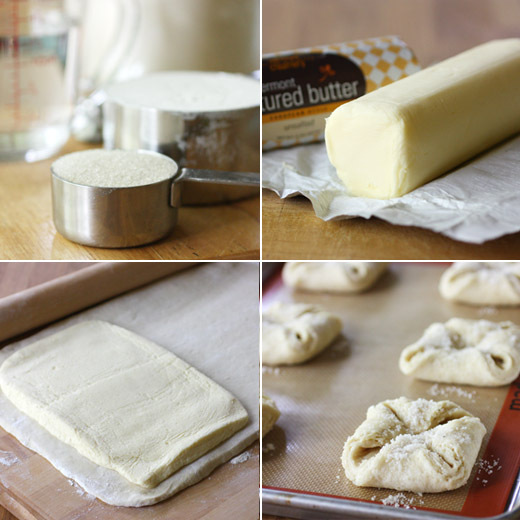 Place the butter block on one side of the dough and fold the second half over the dough block. Press along the edges of the dough block to secure the butter inside the dough. Sprinkle the work surface evenly with 1/4 cup (50 g) sugar. Place the dough on the sugar and roll out into a rectangle approximately 12 by 18 inches (30.5 by 46 cm). Sprinkle the top with 1/4 cup (50 g) sugar. Fold one short half toward the middle and fold the other half over on top of that, as if you were folding a business letter. Cover with plastic wrap and chill for 20 minutes. Again, sprinkle your work surface with 1/4 cup (50 g) sugar, and sprinkle 1/4 cup (50 g) sugar over the top of the dough in an even layer. Roll out the dough into a rectangle 12 by 18 inches (30.5 by 46 cm) and fold into a business letter again. Cover and refrigerate for 45 minutes. Preheat the oven to 400°F (205°C). Line a half sheet pan with parchment paper. Sprinkle 1/2 cup (50 g) sugar onto the work surface and roll the dough into a rectangle 8 by 16 inches (20 by 40.5 cm). Using a very sharp pastry wheel, cut the dough into eight (4-inch / 10-cm) squares. Prepare each pastry by folding each corner of the square toward the center and pressing the corner to seal into place (you’ve just created a smaller square). Continue until you’ve finished folding all the squares. Sprinkle the squares with the remaining 1/4 cup (50 g) sugar. Cover with plastic wrap and allow to rest for 20 minutes. Bake for 20 minutes, or until the top is a deeply golden brown and caramelized. Eat while warm! I had no idea how little I knew about Brazil. Obviously, I need to visit this country. Happily, I’ve learned a few new things during the Central Market Passaporte Brasil event which continues until May 7. For example, I was previously completely unfamiliar with Brazilian wine. Now, I know there’s a very active wine industry there making fantastic wines of all kinds. One of my favorites that I tasted was a sparkling wine from Casa Valduga which was crisp with acidity and perfect for pouring this summer. I also learned about Shrimp Moqueca which is a spicy stew with bell peppers, chiles, coconut milk, coconut shards, and dende oil but more on that in a moment. Throughout the two-week event, there are tastings, musical and dance performances, special products in the store, and classes focused on Brazilian food and wine. 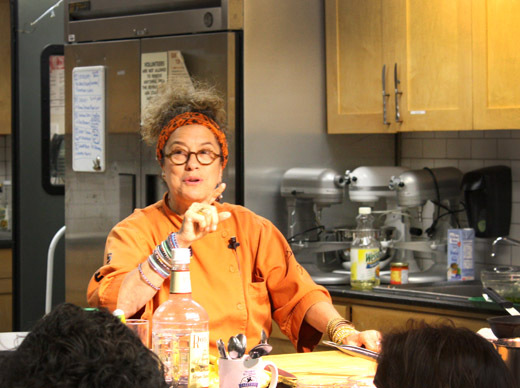 I attended the Inspired by Brazil class taught by Susan Feniger with a media pass and received a copy of her book Susan Feniger's Street Food . She demonstrated several Brazilian-inspired dishes while explaining knife techniques and cooking tips and teasing the cooking school staff. She said in her restaurants, her own staff often says “here comes Susan, quick add acid, add salt.” That’s because she wants every dish to taste like the best thing you’ve ever eaten. If a salad or sauce was made in advance and has been sitting, the flavor has a chance to dull. You need to taste it again before serving and perk it up. Everything served that night was full of exciting flavors with citrus, chiles, ginger, and cilantro. She started off by making a ginger and lemongrass tea with honey. Once steeped, it’s lovely by itself or makes a great base for a cocktail. And, then she realized everything we would be tasting that night would have ginger and/or cilantro in it. I was perfectly happy with that. Our first course was Ceviche with Mangos and Sweet Potatoes. Feniger’s preference is for ceviche to be about one-half fish and one-half other ingredients. The result is a nice mix of textures. 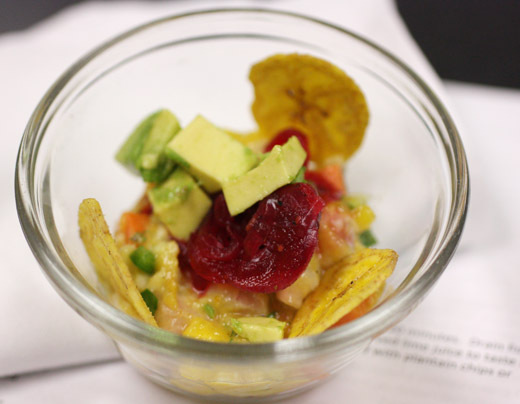 Here, the ingredients were diced fish, lime juice, red onion, jalapeno, mango, diced and roasted sweet potato, aji amarillo, minced ginger, chopped cilantro, pickled red onion, and plantain chips for serving. You could fry long slices of plantain and pile the ceviche on top, or serve smaller chips for scooping. Next was a salad that could easily be a meal in itself, and it will when I make it at home. The Vegetable Salpicon was a mix of julienned carrots, chayote, and radishes, blanched green beans, red cabbage thinly sliced, chives, and cilantro leaves. All of those vegetables were tossed with a dressing made with garlic, ginger, lemongrass, jalapeno, white wine, and champagne vinegar which were simmered until reduced. 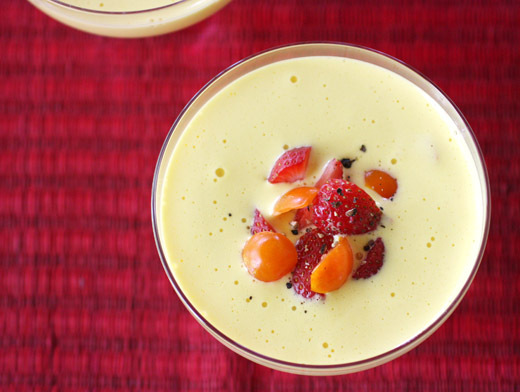 Then, saffron was added and allowed to steep before mayonnaise was incorporated. Crispy, shoestring potatoes were tossed with the vegetables and dressing, and the salad was topped with more potato strings. And, then I was introduced to Shrimp Moqueca (photo at top). 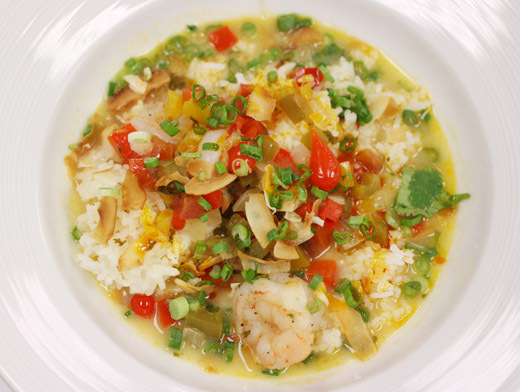 This lovely, spicy, shrimp stew can be dressed-up and garnished in various ways or kept simple as you wish. It’s started by cooking diced onion and bell pepper to which tomatoes and chiles are added. Fish stock and coconut milk are poured over the vegetables, and it’s left to simmer. Meanwhile, shrimp were cooked in a separate pan, and sliced green onions, lime juice, dende oil, and cilantro were added. Just before serving, the shrimp mixture was added to the simmering coconut milk mixture. To garnish, toasted coconut shards, diced lime supremes, and sweet-spicy little peppers like peppadews were placed on each serving. I’m so happy to have learned about this dish. The last course of the evening involved a few different parts. 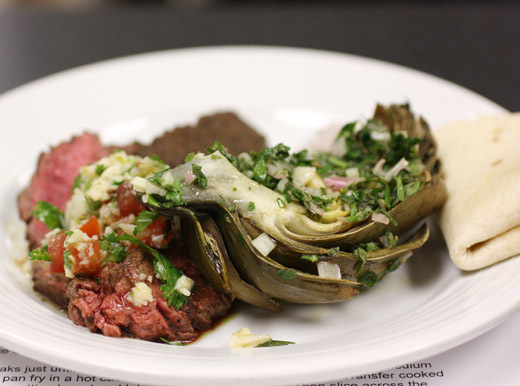 First, there were quartered, cooked artichokes topped with an oregano salsa verde and served with olive aioli. Dipping the salsa-dressed artichoke leaves into the aioli was delicious. And, that was served next to sliced grilled skirt steak that had been marinated with a thick, pureed mix of jalapenos, garlic, lime juice, cilantro, and olive oil. Feniger suggested trying that marinade on fish before grilling, and I can’t wait to do that. The skirt steak was topped with a hearts of palm chimichurri which would also be great with fish. I’m not sure when I’ll get to Brazil, but in the meantime, I have several new dishes to make at home while dreaming about it.